The Robocup Standard Platform League competition is a highly competitive league, with very little separating the top teams. Winning the competition in consecutive years is particularly challenging as other teams look to counter the tactics and game play of the previous champions. As the reigning champions from 2014, team UNSW Australia was able to overcome this challenge and win the competition for a second consecutive year. Although this success is not only related to developments from this year, this paper focuses on the new innovations and development by team UNSW Australia for the 2015 Robocup Competition. These innovations include white goal detection, whistle detection, foot detection and avoidance, improved path planning and new odometry. The 2015 team wish to acknowledge the legacy left by previous rUNSWift teams and the considerable financial and administrative support from the School of Computer Science and Engineering, University of New South Wales. We wish to pay tribute to other SPL teams that inspired our innovations in the spirit of friendly competition, especially to Thomas Hamboeck and the Austrian Kangaroos for their insights into whistle detection methods. 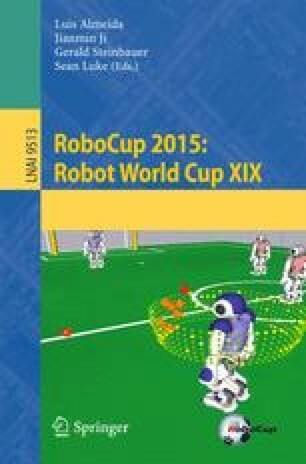 References identified as UNSW CSE Robocup reports and other Robocup related references in this paper are available in chronological order from: http://cgi.cse.unsw.edu.au/~robocup/2014ChampionTeamPaperReports/.